My nine year old daughter still doesn’t quite believe me about the first time I got a mobile phone. “How old were you?” she asked hoping my age would be similar to hers so she could get one. She laughed, then stopped abruptly. She still can’t grasp the concept that cave men didn’t sit on top of rocks texting each other about Mammoth sightings. I still remember starting work for an international aid agency and there being no website and email. We did archaic things such as faxing. Oh, and calling people on a telephone. Damn it, I even hand wrote all my university essays. I vaguely remember there being something called a ‘computer room’ on campus but I had no idea what I would do in there. But from the first twangs of that first dial-in to the internet, my technical tolerance and turbulence has accelerated at a frightening pace. In 10 short years, my world has transformed. I’m write this now an my Macbook, on which I can be alerted about my messages, texts, tweets, appointments, while accessing all my music, and photos and gleam any piece of information about any topic from a mind-boggling googling gadget. Beside me is my mini iPad, and beside that is my mobile phone. I am never far from any of them. My mum and I wrote each other letters all our lives, but soon I was leaving her far behind. And already my child is overtaking me. She is already tutting at my incompetence. She makes videos – funny, smart, edited pieces of art – like I used to make paper aeroplanes. Yesterday I got a fully rolled eyes, sigh response because I couldn’t pick up fast enough WHAT SHE WAS TRYING TO TEACH ME! And it makes me laugh…. but it also makes me sad. I might have been ancient getting a mobile phone at 32 but my mum was positively antique at 60. But she got one and took to it with gusto. If talking was an animal, mum would have been a cheetah. She could outrun anyone on the talking front. She used to complain that doing the food shop took her all morning. She failed to see that talking to everyone she met at the frozen peas delayed things somewhat. So if I thought getting at least three phone calls a day was intense, once she got the hang of texting I was pursued with relentless relish. But sometimes she couldn’t work things out, and I really regret not being more patient. I regret not sitting with her longer while she tried to work out internet banking instead of getting up and telling her to just go to the bank. I think in the last five years she has stayed still, while the world has whizzed past at broadband speed, she would have loved skyping and she would absolutely loved being able to message my older girls with that same relentless relish. I’ve no doubt whatsoever I’d have woken every morning to a FaceTime grin and “good morning!” from her. My daughters are full steam ahead into the world of technology – they are known as digital natives, while I am of the generation of merely internet users. They will grow up using technology as I grew up using a pen. Fundamental to communication. The divide between my mum’s generation and my daughters’ generation are world’s apart with me sandwiched in the middle. But then I think technology hasn’t left her behind. It is dragging her along. She has a Digital photoframe beside her bed and like a film reel it flashes the story of her life and the story of her loves. It is a constant, streaming reminder that although her life is a still frame, it is part of a moving picture. My girls send her videos they’ve made, and we can Facetime over breakfast and make her part of our everyday life. And when I go to see her I show her all the latest photos on my ipad. She can’t use the technology that has passed her by, but we can use it with her, and for her. At the moment I am still in the race with my girls, but I’ve no doubt they will someday pull way ahead. I just hope they don’t leave me behind. 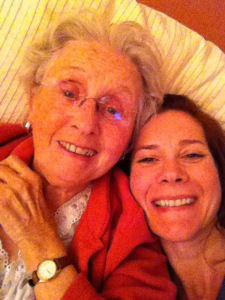 I hope they can include me in the latest technology trends … like me and my mum. Here’s our latest ‘selfie’. You always manage to make me feel attached to your stories. I laughed at the begging of this post with your technology jokes and almost burst out into tears by the end of it. You write so beautifully and I feel that I learn a lot about life from you. I’m in my twenties but your advice always helps me to get prepared for my sandwich years. Thanks Ms. Alana.